Since our childhood, when we started playing with the magnets, the magnetic phenomena began to fascinate us. In fact, it still fascinates us; how a magnet can be used to attract certain materials like all things iron and how the same magnet has literally no effect on rubber, wood, or paper for that matter. Over time, we started to exploit magnetic properties and understand why two magnets can either attract each other or repel each other. It was not until the high school, we began to understand the concept of magnetism. Since then, everything has become clear and magnetism has become a highly diversified discipline that has opened up insanely new possibilities for scientific and technological developments. Interesting enough, a significant number of modern day conveniences are based on magnetic phenomena. The most remarkable manifestation of magnetism in solids is the spontaneous magnetization of ferromagnetic materials such as iron or magnetite. Magnetism is a pervasive and largely unnoticed component of the technology underpinning modern life. Electromagnetism, on the other hand, is the combined power of electricity and magnetism. It is the branch of physics that deals with the study of electromagnetic force. It basically deals with electricity and magnetism and the interaction between them. In other words, electricity and magnetism are the two aspects of electromagnetism. In fact, electricity and magnetism are so closely interrelated that they are regarded as aspects of a single phenomenon, which is known as electromagnetism. Both magnetism and electromagnetism are fundamental concepts in physics that are somewhat related to each other. Magnetism is a physical phenomenon, a highly diversified discipline that’s closely associated with magnets and magnetic fields, which are triggered from the motion of electric charges. A pointed piece of mineral called magnetite turns north-south when placed on the surface of water or supported in air. As such, magnetite is still the most remarkable manifestation of magnetism in solids. The magnet’s ability to attract certain materials like a remote control has fascinated countless spirits since the beginning and interestingly, it still fascinates us. Because of magnetism, a magnet attracts other magnets or sticks to your refrigerators or other metals with strong magnetic properties. 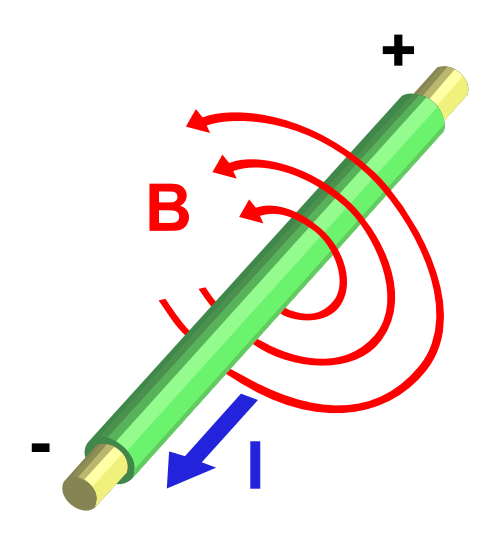 In simple terms, magnetism is a force or a property that can cause two objects to attract or repel each other due to the motion of electric charges. Magnetism and electricity are the two fundamental aspects of electromagnetism – it is the branch of physics that deals with the study of electromagnetic force and deals with electricity and magnetism and the interaction between them. It is the phenomenon that describes the interaction between electric fields and magnetic fields. There are two kinds of forces in electromagnetism – the ones associated with stationary electric charges and those associated with charges in motion. The phenomenon of electromagnetism is better described by saying that there are two kinds of electric charges and that like charges repel each other and unlike charges attract each other. The charge carried by the proton is called positive charge, and the charge carried by the electron us called negative charge. Both are fundamental concepts in physics that deal with magnetic forces. Magnetism is defined as a force or a property that can cause two objects to attract or repel each other due to the motion of electric charges. It is a physical phenomenon that is closely associated with magnets and magnetic fields. 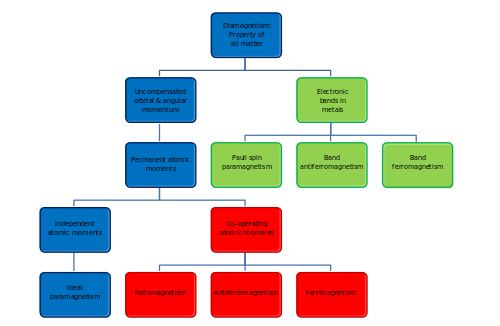 Electromagnetism, on the other hand, is the branch of physics that deals with the study of electromagnetic force and deals with electricity and magnetism and the interaction between them. It is the phenomenon that describes the interaction between electric fields and magnetic fields. Magnetism and electromagnetism are essentially sides of the same coin because a changing magnetic field creates an electric field and vice-versa. Magnetism refers to the magnetic properties of objects that have the tendency to attract or repel each other. It is caused by a simple permanent magnet. Electromagnetism, on the other hand, refers to the properties which govern the rate at which an object responds to absorption or emission of electromagnetic radiations. It is a temporary magnet which creates a magnetic field when electric charges pass through it. Electricity and magnetism are the two fundamental aspects of electromagnetism. Electricity induced magnetism is called electromagnetism. It is the phenomena associated with magnetic and electric fields and their interaction with one another. 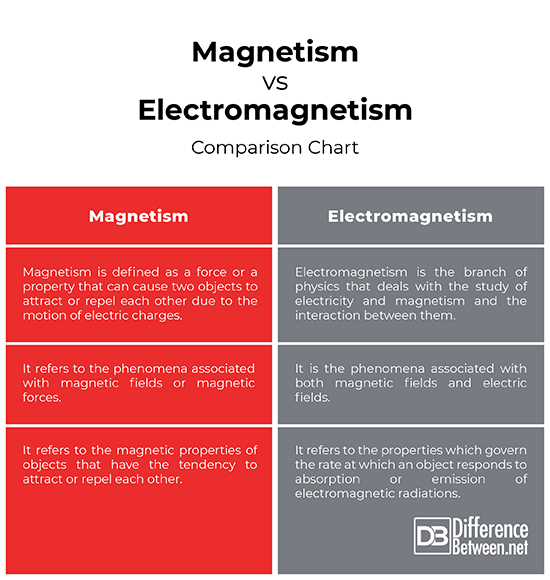 The key difference between the two is that magnetism refers to the phenomena associated with magnetic fields or magnetic forces, whereas the term electromagnetism is the type of magnetism produced by electric current, and is associated with both magnetic fields and electric fields. The ability of certain objects to attract towards magnets is called magnetism whereas electromagnetism is the phenomena concerned with electromagnetic forces. Magnetism and electromagnetism are essentially two sides of the same coin that differ in their phenomena. While magnetism refers to the phenomena associated with magnetic fields or magnetic, forces, electromagnetism is the phenomena associated with both magnetic fields and electric fields. Since the dawn of the human race, magnetism has become a fascinating yet equally diversified topic of interest that has opened up new possibilities for scientific and technological developments. Electricity induced magnetism is called electromagnetism, which is the branch of physics that is concerned with the relation between electricity and magnetism. Sagar Khillar. "Difference Between Magnetism and Electromagnetism." DifferenceBetween.net. January 10, 2019 < http://www.differencebetween.net/technology/difference-between-magnetism-and-electromagnetism/ >.